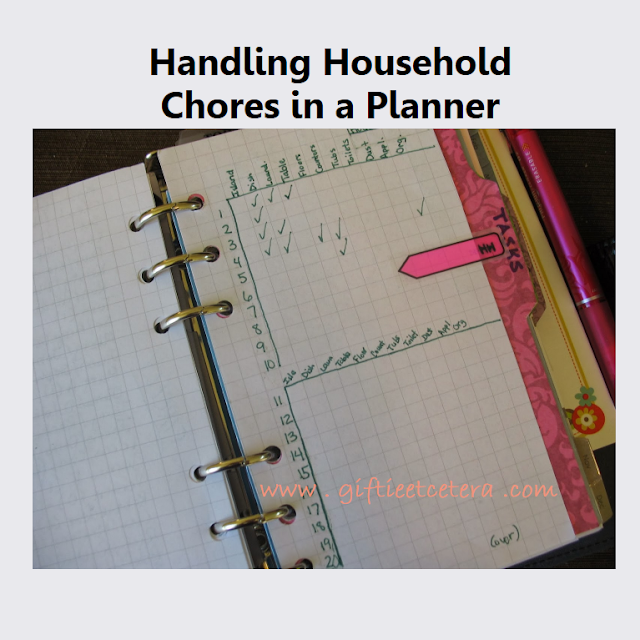 I used to handle household chores in my planner, but I moved to an app. Big mistake! I rarely glance at the app. Instead, I'm going to revert to my old way of tracking household chores. Read about the plan to tackle household chores here. TIP: This chart also works for getting fit (with goal items such as workout, stay under calorie count, eat 3 veggies, check weight) or any other routine set of activities. Order some graph paper or print some out and join me with your own Household Chores tracking chart. I do this with my reoccurring tasks and just about any other kind of task! Honestly, this sort of tracking system has almost replaced by monthly pages. Maybe it's because I'm a student and I find myself in a rhythm that repeats from week to week. Apps never have helped me with these reoccurring tasks. My phone and tablet already distract me enough as it is! I just created a color coded cleaning schedule giving a different color to each assigned day. Problem with that is I got overly ambitious yesterday and began cleaning things assigned to another day, but had no way of tracking that those items were done so I dont clean them again on the assigned say. I think a checklist is more the way to go rather than locking in certain cleaning on certain days. With the checklist, I can do what I have time for that day and check it off on that date so u can visually see when it was done last. Since I follow Flylady's cleaning schedule and get each day's plan and tasks the night before, I just put that day's cleaning to-do on my daily planner page. It's just 1 or 2 items. You totally need to go with the system that works best for you with chores. For me I've tried both paper and online planners but in the end simply assigning a task to a day so I would just know what I'm supposed to do that day has worked out the best for me. There is definitely something more visceral about crossing off a task on paper though! I am the same way with technology. My lists on paper are so much more likely to get done. Thanks for linking up to the Country Fair Blog Party this month. I do hope you will join us again on the first.